In this end-unit townhouse in Alexandria, our design oriented clients wanted custom detailing throughout their project, which included a vast wish list of spaces. On that list was a new deck, with a waterproofed terrace below. They also wanted a water feature, two storage sheds and a lot of planting throughout. All of this was to be achieved in a rustic but upscale finish that went with the location of the property in Old Town Alexandria. A significant challenge of the project was the large grade change over a rather small distance, coupled with the numerous features the client wanted in that area. The property's backyard also backed-up to a city park. This meant of paramount importance was making this side both coherent with the park's landscape but also visibly beautiful. The client continues to be pleased with the finished product which granted us the highest award of craftsmanship for the wonderful details we design and built on the project. Views of the backyard from the back entry gate. 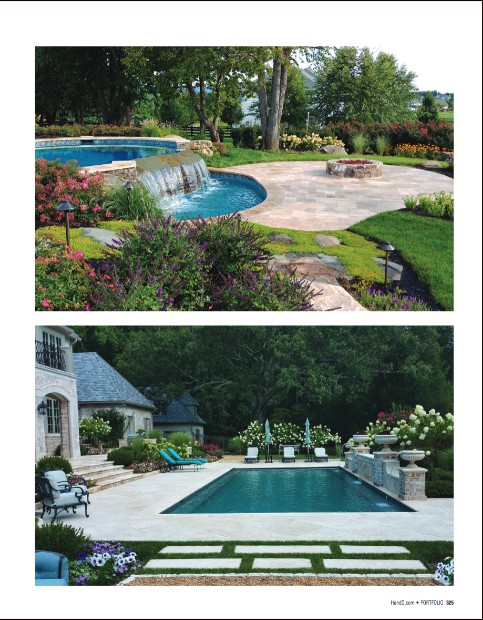 The first of our three award winners to be showcased is a pool project in Aldie, VA. 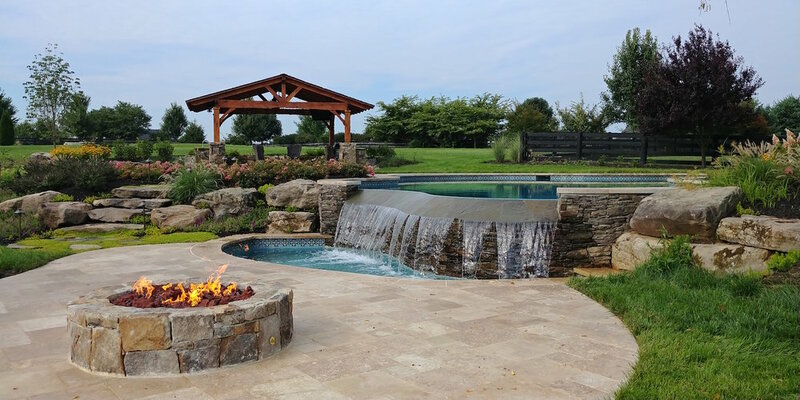 Built in several phases, this project included an infinity edge pool, a full outdoor kitchen, pavilion structure, fire-pit, and extensive plantings and exterior lighting. 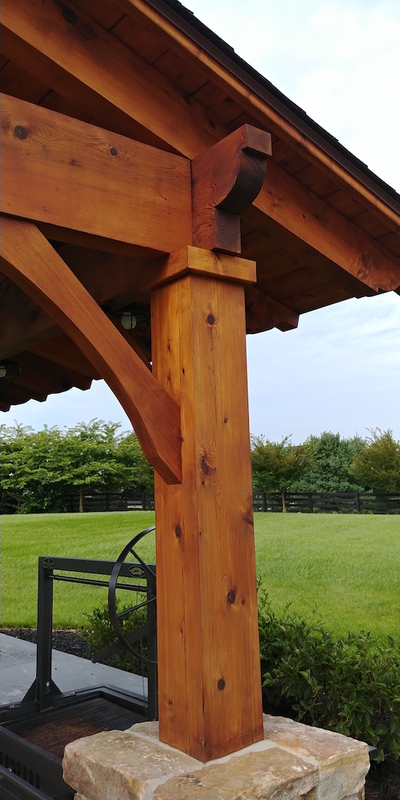 The client wanted a more rustic outdoor environment that fit with his expansive property and neighboring horse farms, while still having a architecturally pleasing and upscale feel. Using natural materials and significant boulders and planting materials we ended up achieving his goal. 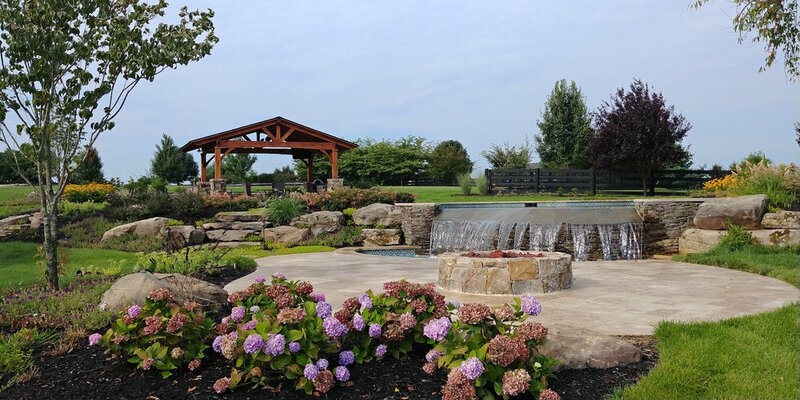 The client was extremely happy with the finished product, as we were being recognized by the LCAs (Landscape Contractors Association) for our efforts. A before shot of the property. The architectural plan showing the future outdoor environment. The 3D rendering created to show the client what the finished product would look like. Views from the outdoor pavilion and kitchen. A close-up of the detailed carpentry work. Thick cedar was used for all elements and worked on-site to give a more rustic appearance. A close-up of the natural stone serpentine infinity edge. A close-up shot of one of our award winners. Colao & Peter is extremely proud to announce we have received some of the top category awards in the annual landscaping contractors association excellence in landscaping competition. 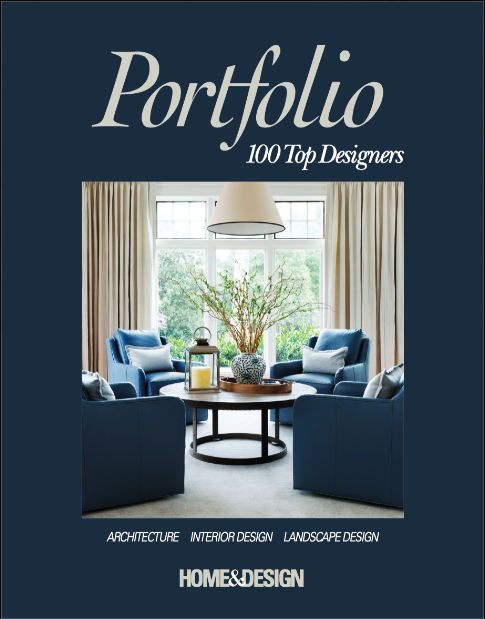 These awards, judged by a panel of our peers, are a true honor to receive as they reflect the amazing efforts of both our design and installation teams. We take pride in even the smallest details and execute them to the highest level of the industry, as can be see in from the photographs of the award winners. Please note that in all photos, all work was designed and built by our capable team, including the pools, masonry, carpentry and planting. 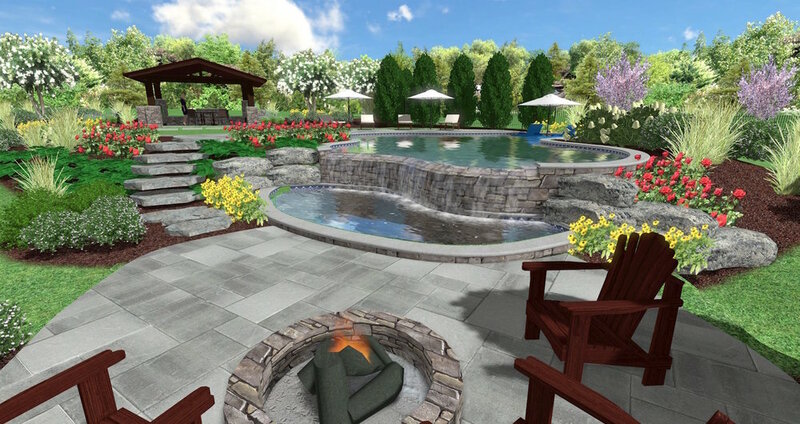 Most importantly we want to thank our clients for having the confidence in us and allowing us the opportunity to design and build their outdoor living environments. We will do an individual post on the awards winning project but here are some snapshots of the winners. 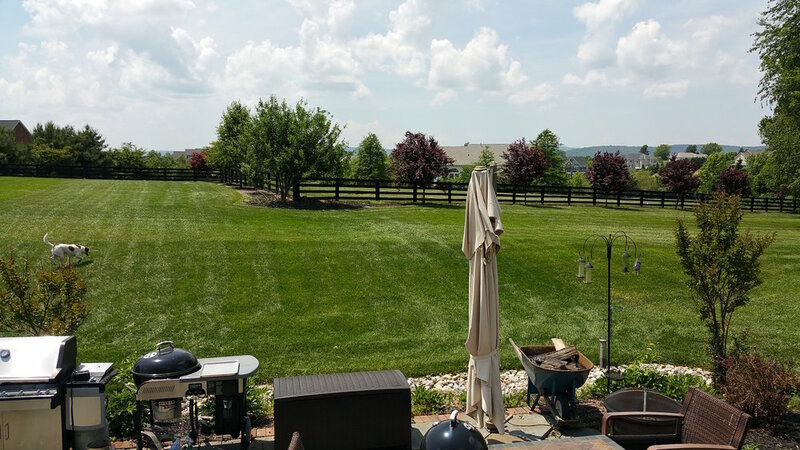 Our wonderful backyard sanctuary in Aldie Virginia that includes and infinity pool (with wading basin), fire pit and outdoor covered kitchen. An end unit townhouse in Alexandria where the client wanted many different uses to the space wanted all elements to have unique detailing. Of particular interest, note the "pierced brick" boundary fenceAll the brick was hand cut on site. A spa like retreat in DC greets these clients in their backyard when they come home. At the recent 2016 LCA Awards, we were very pleased to have won three grand awards for craftsmanship. These awards are the highest distinction in the category and are given to projects that demonstrate the creative use of materials, installed to the highest tolerances of industry standards. 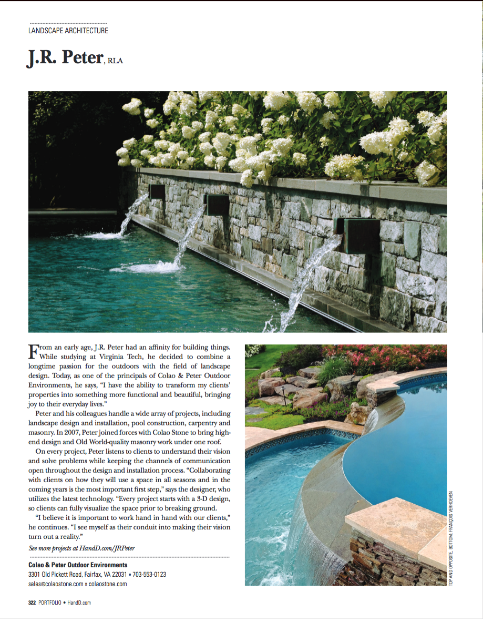 In the project showcased below, we worked on an entire exterior renovation project which included a complete pool rehab. 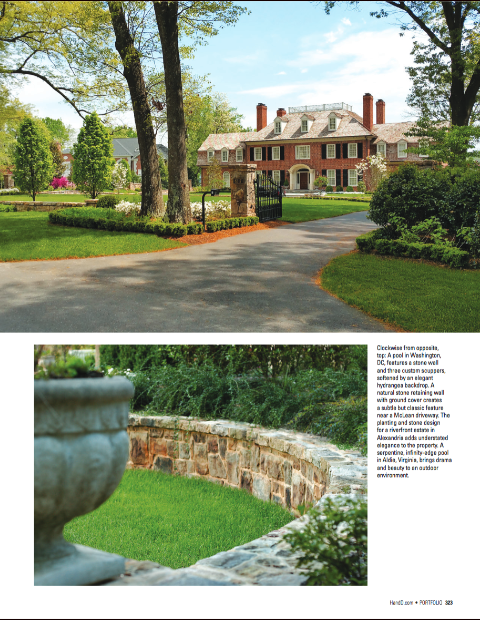 The client wanted to a conjure the imagery of a French country estate. As such we used light paving and wall materials, in this case custom ordered travertine (including 36”x 36” pavers with antique finish) from the same blocks, which we sourced directly and inspected in Turkey prior to shipping. We also minimized paving by using pea gravel for the driveway and walkways to keep the more natural feel of the wooded lot. The project scope consisted of a full front and back renovation, including front entranceway, driveway, pool renovation, pool decks, fire pit, water and fire features, patios, raised terraces, drainage, plantings, low-voltage lighting and custom accents throughout. We are extremely proud of the way the design/build effort came together on this project and appreciate greatly the client’s trust in us to deliver them an architectural pleasing and functional space they can use for years to come. 3D modelling software has made it so clients can see a project a before a shovel goes into the ground. The pictures below represent a completed job site prior to design, one of the 3D images used to show the client the finished product and then the finished product itself. Note the almost perfect match of the 3D renderings and the finished project. Our clients will never wonder what the finished product will look like. They can see their project prior to the build from any angle and from any time of day they wish, taking all the mystery out of construction and the final product. The "before" view of the area prior to the landscape build. The approved 3D design of the project. It was announced that Colao & Peter was awarded three awards for superior craftsmanship at the 2016 LCA. 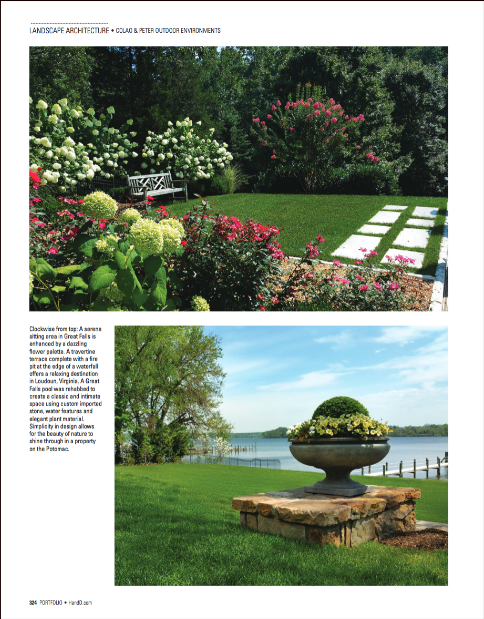 The awards, given for the best landscaping projects in the Washington DC metropolitan area, were very special to us because each was given for a completely different architectural style. We are extremely thankful to all the hard work and dedication by our staff who designs and installs these amazing projects and to our clients for allowing us the privilege to work with them in creating their dream outdoor environment. Wonderful clients in Alexandria, VA hired us to create a modern outdoor living environment for them and their children to enjoy. Among the parameters of the project were to create connected but defined destinations for their various entertaining needs, while also maintaining green space and gardens. Using a mixture of steel accents, reclaimed wood and custom stone, we were able to create a visually interesting and extremely usable outdoor environment that included an outdoor kitchen, a fire-pit with seating area, a secret garden and additional patios and play areas for their children to use. The client couldn't be happier with the finished result and we are proud of our design and installation teams for their level of detail and craftsmanship on this project. Chrome fountainsline path between outdoor dining and fire-pit patio. Tiled outdoor kitchen with reclaimed wood backdrop to hide existing shed structure. View of connected patios and outdoor living spaces. Close-up of custom stainless steel fire-pit with tile risers and granite cap. Boulders and rock garden with modern low voltage lighting features. Reclaimed wood seat wall around deck. Close-up of painted steel and synthetic materials. Secret garden with water feature. Close-up of before the project started. Originally designed out of wood, our client agreed to enhance the Georgian Architecture of his new home by using a more authentic material, limestone, for his entry portico. Based on color and ability to work the stone, we chose a french stone for the project. Trying to stay true to the architecture and add structural strength to the portico, each piece was cut from a solid piece of stone, with the coffered ceiling being hand carved by french artisans. The portico was laid out in the factory to ensure that the it would assemble correctly on site. After the inspection at the factory, we shipped the stone to Alexandria, where our masons installed the massive pieces of limestone. A final piece of copper will be installed on top of the limestone to protect the stone. This pool in Alexandria on the Potomac River is the first of four new pools being built by us in June and July. We also have several pool rehabs under way that will be completed and the pools opened in the next few weeks. All projects are design/built by Colao & Peter and all stonework in the project photos are installed by our in-house masonry teams. This is a 3D Rendering we just completed for a client presentation. The client wanted a landscape package to include a spa, fireplace, patios and some falling water and asked us to complement his natural surroundings and the modern architectural style of the house. 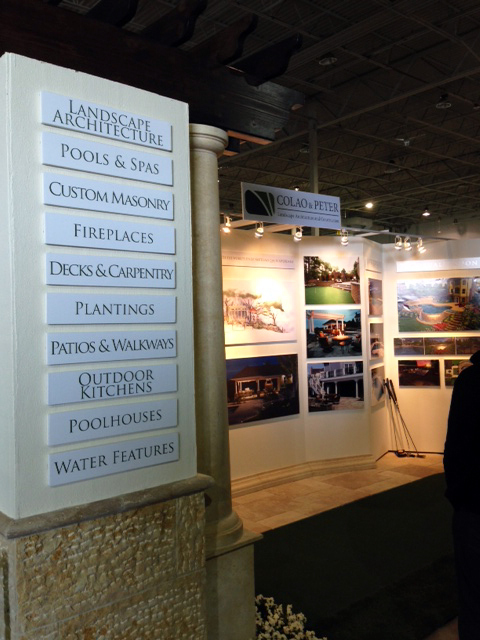 Capital Home + Garden Show Success! 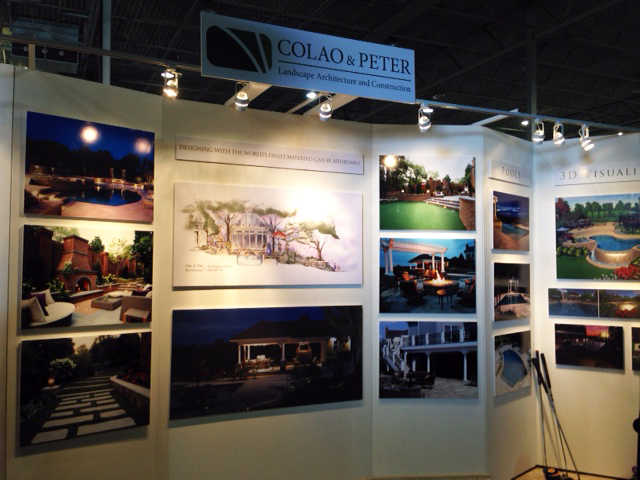 We want to extend a huge thank you to everyone who visited the Colao & Peter Landscape Architecture & Construction booth this past weekend at the Capital Home + Garden Show. We had a lot of interest in our booth and services, making the show a huge success! We also had the opportunity to do two presentations on the main stage both titled, "The Future of Landscape Architecture -3D Visualization." Sunday's presentation went exceptionally well with 60-70 attendees. Finally, we were awarded “Rookie of the Year” by show management based upon our booth design and presence at the show, which was a great way to cap off the whole weekend. Thanks again to everyone who stopped by. You made our weekend! The team proudly showing off our Rookie of the Year Award. Services column and booth and putting green. Natural Jerusalem Limestone pillar and base. Our Rookie of the Year Award! For this project in the Fairfax Station, Virginia, our client wanted to resurface the existing deck, add a fireplace and update the existing landscaping. To soften the transition from the deck, which was resurfaced using synthetic materials and a new wrought iron rail, our design team removed the existing stairs and created a series of terraces. This created new space in otherwise unusable land and a gradual descent to the lower terrace and patio.